Lucille Worrell recieving her check from country manager Jeffrey Baptiste after Friday's drawing. Alas, all my $20 dollar top ups were in vain. I am not a merry millionaire. 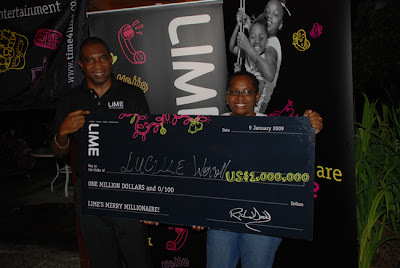 But I happy so happy to state that a fellow Dominican, Lucille Worrell of Fond Cole won A MILLION US DOLLARS courtesy of LIME. She was one of 300 customers who qualified for the Grand Prize Draw after winning weekly prizes. Lucille qualified for one of the weekly drawing and won an I-Pod Nano from paying her fixed line bill. Worrell who has a young son plans on investing the money on his education, building her home and contributing to her Catholic church. This promotion began in mid-November. LIME customers qualified for weekly prizes by signing-up for a new service, upgrading an existing service, paying their bill in full and on time, texting “Win” to LIME (5463) or topping-up $20 or more on their mobile phones. Three hundred LIME customers from across the Caribbean, won weekly prizes including plasma TVs, computers, laptops, digital cameras, BlackBerry™ smartphones, Ipaq phones, Sony Playstations and lots more.